For your busiest clients, regaining or maintaining fitness (much less training for sports excellence) can prove to be a severe challenge. When faced with a client who has very little free time, figuring out a way to add in workouts to an already packed and exhausting schedule can prove quite challenging, to say the least. Overworked and rundown, these clients are often burdened by the idea that in order to reap any fitness benefits from working out, they need to have at least an hour a day or more of free time – time enough to drive to gym, change into workout clothes, attend a session with a personal trainer or take a relevant class, and then time to shower, eat a recovery meal, and get back to work or head home to make dinner for the family, and so forth. This belief has led them quite frequently to forgo any efforts at maintaining physical fitness whatsoever. I love working with clients like this, despite the obvious scheduling difficulties that such a hectic lifestyle presents. The reason? These people – the busiest of the busy – can benefit so much from numerous studies (see here, here, and here) that demonstrate how significant fitness gains can be made in relatively short amounts of time, so long as that time is spent effectively and efficiently at a high enough intensity. 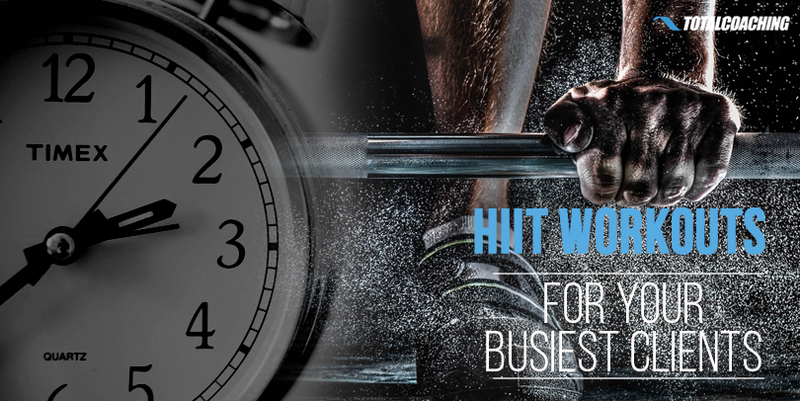 In other words, High-Intensity Interval Training (HIIT) workouts are the solution for the "I have no time" excuse we often hear as personal trainers. I also find that my busiest clients tend to have less of a tendency toward overdoing it in training, as they simply cannot put in the same amount of time training as my less time-restricted clients do. In other words, the time-crunched clients will usually just do the workout assigned – or maybe even half of the exercises – and then call it a workout, instead of adding in a whole bunch of “extras” beyond what I assigned for any given day. Because they work out at this high intensity only two or three days each week, they often recover faster from workout to workout and experience fewer episodes of major fatigue and burnout than those driven clients who always want to do a little bit more (or a lot more) than what their training schedule says they should do on any given day. Some of these workouts require only body weight or a few easily attainable props, like a chair or a wall. Others incorporate some at-home pieces of fitness equipment that my clients have indicated they have available, such as an exercise ball, medicine ball, handheld weights, resistance bands, a jump rope, and so forth. This HIIT ﻿protocol can be used effectively for sport-specific workouts, too, making for a great way for time-crunched athletes to squeeze in an effective workout – or even two or three such workouts in a day, targeting different sport-specific areas. Clients can choose to run through each exercise in the circuit one time for a quick but effective workout in 10 minutes or less. Or, perhaps they may choose to do the circuit two or three times in a given day, depending on how much time they have, their recovery level, and their upcoming training/physical activity plans for the days ahead. Rock Climber. Writer. Aspiring Yogi. Climbing Coach/Trainer. Registered Yoga Teacher (RYT-200). ACTION Certified Personal Trainer (CPT). Avid Lifelong Learner. Harvard University Graduate (BA, 1996).